But the crisis described above was much worse than Boeing’s 737 Max troubles, and it happened more than 50 years ago. Boeing obviously survived the crisis from the mid ’60s. So what lessons can it apply to its current situation? While the exact cause of the 737 Max crashes have yet to be determined, there is evidence that pilots were not prepared to deal with an automatic safety system designed to prevent stalls. Investigators suspect the plane’s safety system forced the nose of the 737 Max jets lower before the crashes in Ethiopia and Indonesia. But the crashes in 1965 and ’66 proved that passengers will get over their fear of certain jets fairly quickly if Boeing can prove they’re safe. But the concerns about the 727 faded quickly, and the plane became a major success for Boeing (BA). The 727 had three jet engines on its tail, the first commercial plane with fewer than four engines. That made it more fuel efficient than the four-engine Boeing 707, the industry’s first commercial jet. The 727 also had innovative wings that could slow the plane faster, which allowed it to land on shorter runways. That allowed the plane to land at airports that previously had only been served by propeller planes, a key selling point. One of the planes bound for O’Hare Airport in Chicago crashed into Lake Michigan miles away. 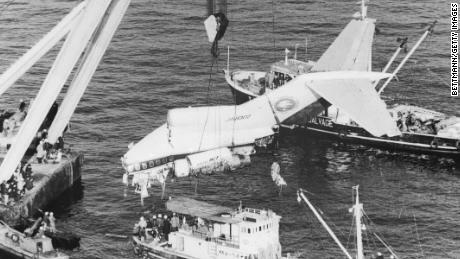 Eventually the Civil Aeronautics Board and the National Transportation Safety Board, the CAB’s successor agency, which was created in the wake of the crashes, cleared the 727 and blamed pilot error for the accidents. “The board determines the probable cause of this accident was the failure of the captain to take timely action to arrest an excessive descent rate during the landing approach,” said investigators looking into a crash in Salt Lake City. Baum points to the recent grounding of Boeing’s then new 787 Dreamliner in 2013 for three months because of problems with battery fires.